"O serpents, the generation of vipers, how should ye escape the damnation of hell!" Sen. John Cornyn, R-Texas, has been looking for an immigration fix for years. But he doesn’t see one in Texas’ efforts to end Deferred Action for Childhood Arrivals, the Obama-era program that offers temporary status to hundreds of thousands of unauthorized immigrants. In September, President Donald Trump moved to end DACA, prompting several legal challenges that are moving forward. Cornyn believes that Trump’s actions will be upheld, which will make it more urgent for Congress to act -- no matter what happens with Texas’ lawsuit. On Tuesday, Texas Attorney General Ken Paxton filed a lawsuit to end DACA, which was joined by six other states. He noted that Texas led a successful challenge to a similar program known as DAPA, Deferred Action for Parents of Americans and Lawful Permanent Residents. “Our lawsuit is about the rule of law, not the wisdom of any particular immigration policy,” Paxton said. There's a word that would perfectly describe what John Cornyn is being here. But it's a swear word and we know how about a third of our readership feels about swear words [Note: Please, No Facebook messages]. So won't say it, but it's accurate. 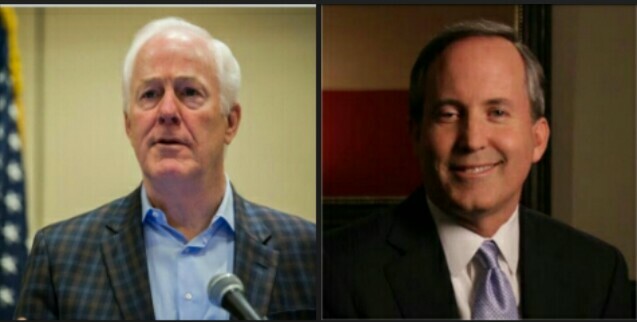 It's also worth pointing out that Cornyn was a major supporter of Dan Branch in 2014.